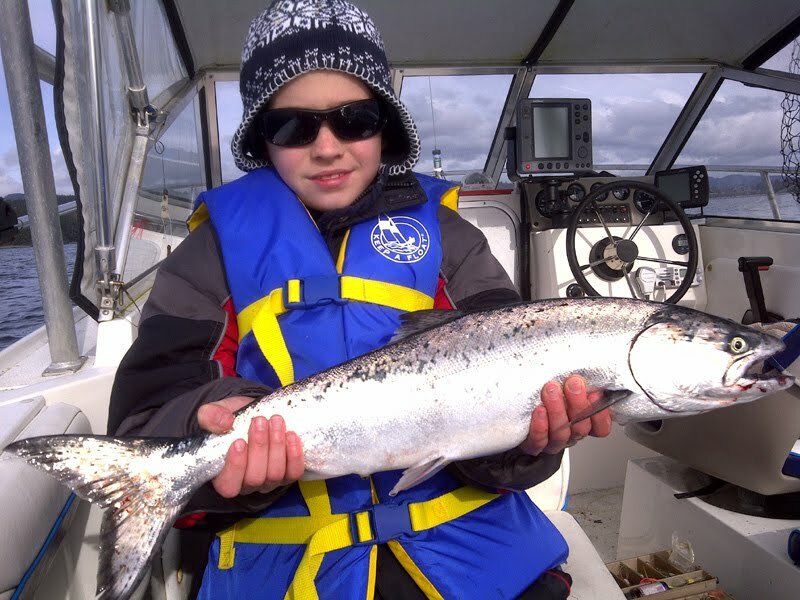 Sooke's winter chinook salmon fishing continues to be productive. We didn't hear of any big ones caught this week, but several reports of salmon in the 8-12 pound range, and steady action for smaller ones. Sunday was one of those beautiful calm-between-the-storms, sunny, no-wind days. On the way out we saw kayakers, paddleboarders, and walkers on Whiffen Spit. There were about a dozen boats clumped together between the Tin Shed and Wells o'Weary, mostly in front of Otter Point trailer park, in 120-150 feet. Action was reported on glow white squirts or irish mist hootchies, or on green/glow coyote spoons, plus any flasher with glow on it. Here's John R with his first ever salmon ... way to go John!